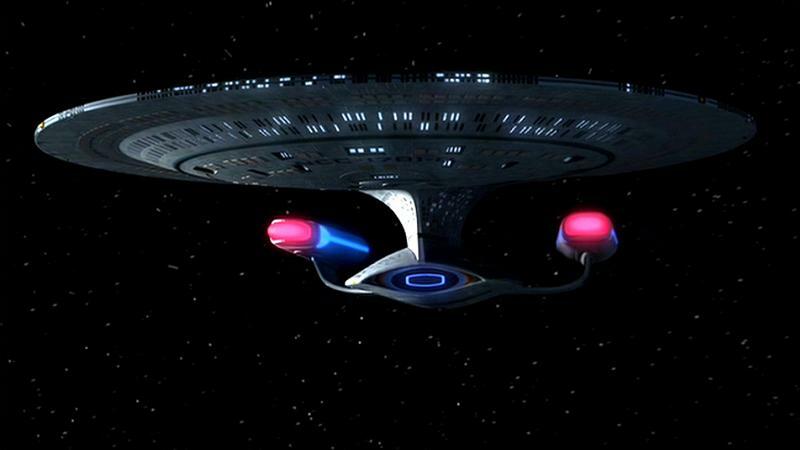 The Enterprise-D, while retaining the general shape of the original ship, was very, very different. Even to this point in the films, we’d only seen ships that kept the hard-edged, militaristic look of the Enterprise: the Reliant was a kitbash of the Enterprise, and the Excelsior was just a newer-looking (and somewhat uglier) version of the Enterprise itself. This new Enterprise? Not ugly. Weird-looking, yes, but not ugly. 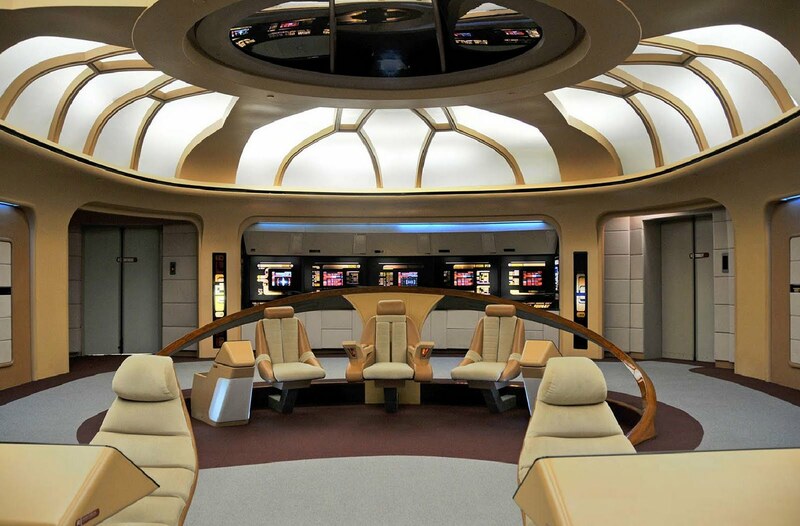 Captain Picard’s Enterprise was a graceful, smooth-edged, curvy sort of beast, probably reflecting that Gene Roddenberry wanted the future of Star Trek to be even less militaristic — from what I’ve read, he originally wanted the bridge to have a conference table, and we all know that he gave the ship’s counselor (a psychiatrist) a seat right alongside the captain. 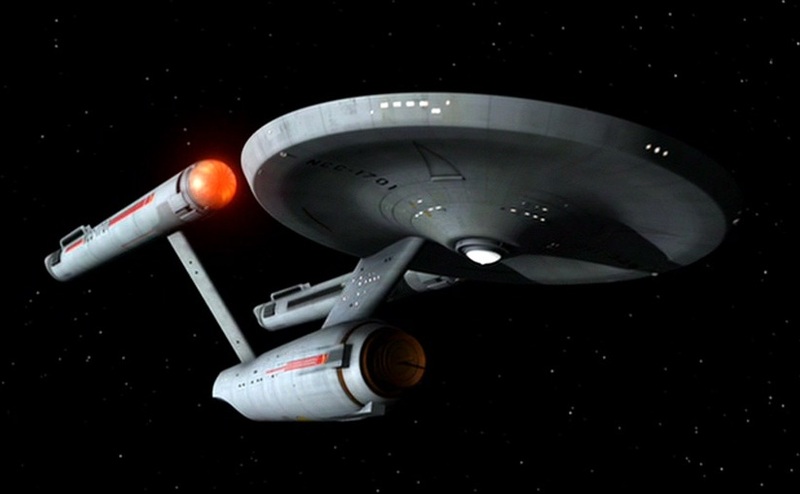 The saucer, where all the families lived, was the largest part of the ship, and while the engineering hull was definitely more streamlined and the nacelles much brighter — always lit up, whereas the original Enterprise’s only glowed when they went to warp speed — it was the saucer that was clearly the most important part of the ship. 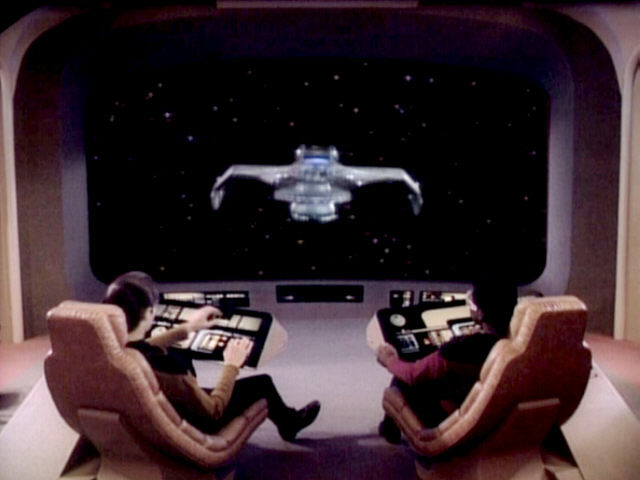 The first episode of the series began with a good look at the new Enterprise before moving inside, and I think by now most fans know the reason the first shot was in the engine room was to avoid the issues that arose in “The Enemy Within” because no shuttlebay sets had been constructed by the time the episode aired. But what an engine room it was — an enormous pulsing warp core clearly dominating everything, with people moving around as if they actually belonged there. Contrast that to the engine room in TOS: there were rarely more than a few extras working in the background, and in some scenes it was Scotty and no one else down there. I realize Scotty’s awesome, but how could one man handle all that technology by himself? And then there was the bridge — the place where the action really happened. The first thing we noticed about it was its immense size: it held a lot more people. And there were more doors, too — while the TOS films corrected the “only one exit” problem the series faced, the Enterprise-D had four distinct exits from the bridge. I’m still not quite clear on why the main turbolifts were both on the port side, but hey, I didn’t design the thing. Also, while the TOS bridge was circular, this one was more oblong, without the positions along the port and starboard sides. I imagine that, if more money had been available, it wouldn’t have just been wooden panels on those walls. As before, the captain’s chair was central to the action, but now the captain shared the spotlight with two others — a first officer and a ship’s counselor — clearly showing how this new iteration of Star Trek was supposed to focus on collaborative decision-making instead of action. This was a criticism early reviewers brought up quite often, and I think it was valid. There’s just something about being the captain, being the be-all-end-all on the ship, and I think that’s why Picard stood up and stepped forward so often: so the writers could remind us of that. Ahead of the captain’s chair were Ops and Conn. In the pilot, Conn (the helm) was on the left, but it moved to the right for whatever reason in later episodes. I guess in the future one person can plot the course and drive the ship — we do it already with our GPSes in our cars, right? Ship operations was a nice way to avoid having the Vulcan-like character of Data be the science officer again. Behind the captain stood the tactical officer, and given how far downplayed conflict was supposed to be, it’s interesting that that person would be placed in every single wide shot of the captain’s chair. Plus, she was standing up, always on the alert, always ready. 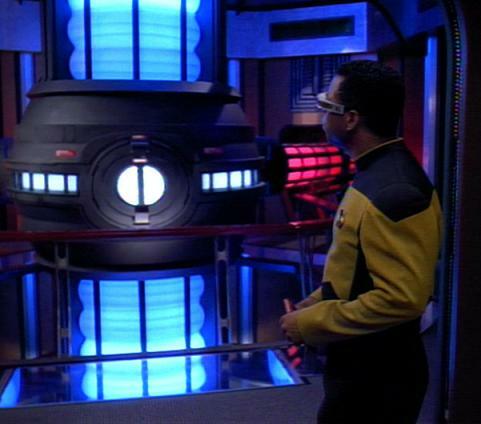 Finally, behind tactical were four miscellaneous stations, one of which eventually became Geordi’s “Engineering: transfer to the bridge” seat. One thing I haven’t mentioned yet was the color scheme of the bridge, which was decidedly bland. Beige walls, beige chairs, beige consoles, mostly gray carpet… I’m not sure whose bright idea that was, but it wasn’t… well, it wasn’t bright, for one thing. It had neither the strong primary colors of TOS nor the darkness of Wrath of Khan. I’m really surprised the bridge itself wasn’t ever refit during the show, although once we got to Generations, it started looking a little better. Perhaps the bland colors made it easier to light and shoot; I really don’t know. And, finally, there was the massive viewscreen — much bigger than that little thing Captain Kirk had to deal with on the original series. Captain Picard got a gigantic window out onto what he was heading toward, although given that this is the future and we’re in space, one would think a holographic battle tank would’ve been better. Unfortunately, I don’t think the effects would’ve supported it. Tomorrow: more about our new Enterprise.